Plan ahead – ask any one of my friends and they’ll tell you I’m a planner. I constantly worry about being late and I HATE not having a plan. While it’s rather annoying to my friends when figuring out weekend plans in Dallas, it’s a personality trait I’ve found very useful while traveling. I do a lot of research on the cities I visit, from which restaurants to go to, to what area I’m in, to the culture and interacting with the locals. I create a pretty elaborate itinerary for every trip, featuring the names, addresses and phone numbers of each place I plan to visit. Not only does this help when I eventually map out my routes to each spot, but I often send it to my mom so she knows where I am at all times (in case anything should happen or she needs to get in touch with me). I also reach out to the concierge of my hotel prior to my stay for their recommendations so I can do research with their suggestions. Pack only basics – I never pack anything flashy or wear a lot of makeup when I’m traveling solo. There’s no point in drawing attention to myself when I’m not planning on being in any of the photos I take. Leave your expensive jewelry at home and don’t bring along your designer bags. You’re just asking to get robbed if you look like you’re wearing anything remotely nice. Map your route before you leave the hotel – this is something I didn’t have to do in London since I had a UK phone, but when traveling to other countries, I always Google mapped the attractions and screenshotted the maps before leaving my hotel. That way I didn’t have to constantly have my head in a paper map and draw attention to the fact that I’m a tourist. It just looked like I was on my phone! Always have cash in the local currency before arriving – not everyone takes credit cards, especially cab drivers abroad, so it’s smart to have some money ready to go when you get off your flight. I also don’t like using the ATM’s at airports – it just seems like a trap. Check in with people – I used Viber and WhatsApp to stay in touch with my family while I was abroad. I checked in with my mom nearly every day by just sending her a text to let her know I was alive. In addition to checking in at home, I recommend getting friendly with the hotel staff. I always make a point to chat with the people at the front desk so they know who I am. That way they sort of keep track of my comings and goings. God forbid something does happen to me while abroad, they’d at least know when I left the hotel last. Take the roads most traveled – I make a point to avoid side streets and smaller alley ways when walking to my next destination. While there may be a greater chance for pickpocketing on a busy street, you’re less likely to get accosted or “taken”. Better to lose your wallet then get assaulted, am I right? Avoid staying out late – I made great use of daylight when traveling. I got up early and made it back to the hotel just an hour or two after dark. I like eating dinner on the early side anyway, so it wasn’t much of a change for me. This time of year it gets dark really early, but generally the streets are very crowded with families and other normal people until 8 or 9pm. I usually grabbed dinner at 6 or 7 and made it back to the hotel by 8! I also didn’t overindulge at dinner – just a glass or two of wine so I was able to focus and stay alert while walking home. Be confident – nothing makes you look more like an outsider than not knowing what you’re doing or where you’re going. Whether or not I knew which direction I was going, I made it look like I did. Keep your head up and walk with purpose. This is also true of eating at restaurants alone – instead of just playing on my phone during dinner, I engaged the waiters in conversation each time they dropped something off. The chef at a couple of the restaurants even came over to chat and brought me free stuff – it’s a win win! Just act like you know what you’re doing and where you’re going. I hope these tips help you feel a little safer when you are traveling on your own. 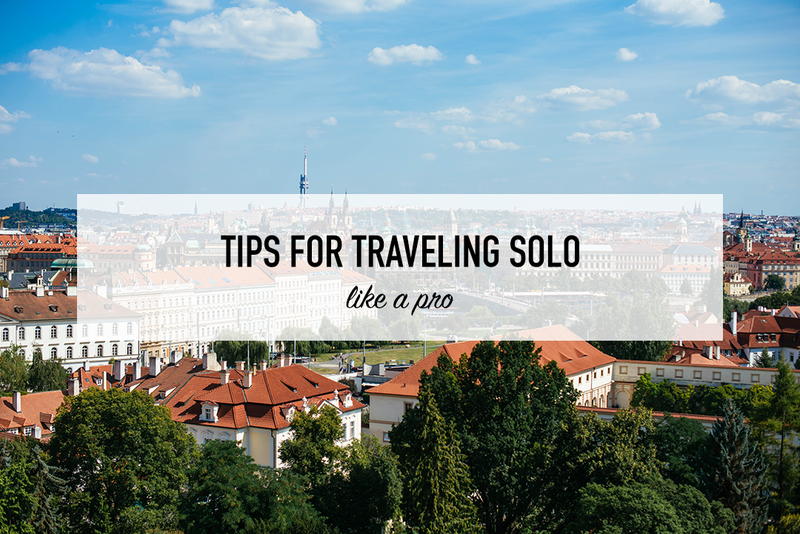 It can be a very fun and freeing experience, so as long as you plan ahead and follow these steps, you are going to LOVE traveling solo! Love this post! I think everyone should spend time traveling by themselves. It’s life changing and such a great experience once you try it! I always buy a prepaid phonecard if I travel somewhere outside zone 1 (which is western europe and the us). this way I can make sure I always have a dataplan to use if I get lost. I usually try to figure out how locals dress before packing – if you look less touristy your less likely to get in trouble. plus I only travel to countries I know a woman can feel save by herself. Thanks for your tips Merritt! Those are all wonderful recommendations. I agree particularly with the “looking confident” piece. That has saved me a lot of hassle while traveling!